Faust - "BBC Sessions +"
Originally included as part of The Wumme Years: 1970-73 Boxed Set, this is now available on its own for fans who may have already have a lot of the other material from the Boxed Set. As the title suggests, this is archival material not only from the sessions recorded for the BBC's John Peel's radio show, but also from other sources. Things kick off with a BBC recording, the 22-minute long medley of The Lurcher/Krautrock/Do So. The Lurcher is, well, a lurching, slow rocker with great late night sax playing that eases into a spacy coda, slipping very nicely into the eastern tinged guitar freakouts, pulsing drums, and buzzing drones of Krautrock, a classic from Faust IV. This new version of the song has more intensity than the original. Less successful is the transition to the 2 ½ minute conclusion of the medley, Do So. Do So is a groovy little pop ditty in the Syd Barrett/Pink Floyd vein. The choice seems odd to end off almost 20-minutes of exploratory instrumental music, but then if you know the work of Faust, they have never made a habit of making safe choices. In fact, Faust's relentless efforts to never be pigeonholed into any category can be heard throughout the album, from (360), a collage of voices, barking dogs, clattering about and what sounds like an acoustic musician playing at a children's birthday party, to Party 10, a brief little piece with kazoo and guitar and vocals in French, to Party 1, an amazing rhythmic workout on percussion with lots of creepy electronic sound effects. On the slightly more accessible side, we have the 6-minute Party 9 which starts out with a bit of whispering and slow drumming in an barren room, but breaks into a cool space rock jam. We also get a tasty alternate take of So Far, a rocker with a great groove, evil sax, funky warbling guitar, and strange, wailing noises that make it sound like jazz straight out of Hell. 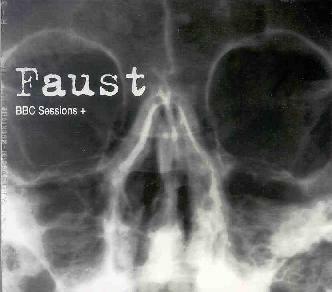 While Faust has never been an easy band to listen to, they are always interesting. They are true originals; there really is no other band that has ever sounded quite like them, as this collection ably proves. It's worth it both for fans, or even as a starting point to discovering Faust's eclectic brand of experimental lunacy. Here's a site on Faust worth checking out: http://www.ondarock.it/Faust.html. It's in Italian, but scroll down and you'll find the English version. Has discography, pics, and even lyrics! BBC Sessions + is released and distributed by ReR Megacorp; 79 Beaulah Rd; Thornton Heath; Surrey CR7 8JG; UK. Visit their web site at http://www.rermegacorp.com/. Distributed in the USA by Cuneiform; PO Box 8427; Silver Spring, MD 20907. Visit their web site at http://www.cuneiformrecords.com.